Have the first prototype of these coming in, interest check time for the extras. Pretty tight SMD build. 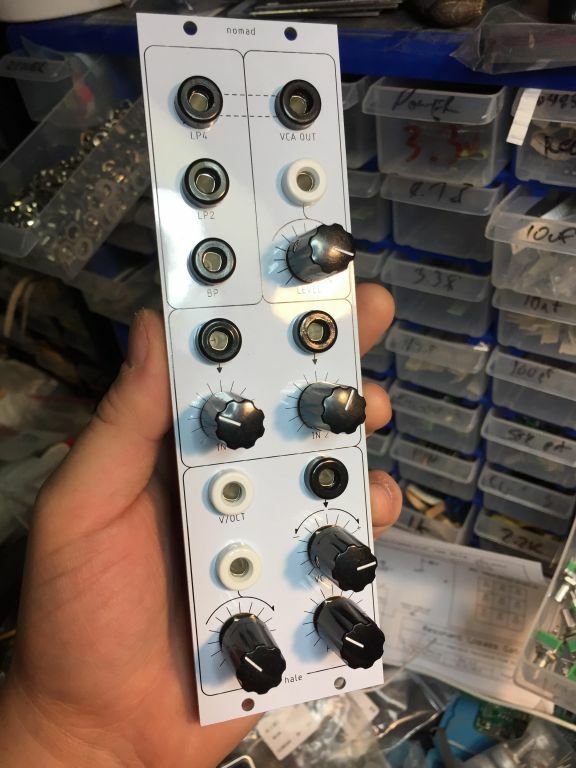 Essentially a middle-years roland filter clone using 13700 instead of ba662/ir3109. SK30a buffers, film caps. BP, 2 pole and 4 pole outputs. 4 pole is hardwired to the VCA which just uses the extra half of an LM13700. 2 inputs, VC over Q and an attenuverted frequency VC input. Well nice, would surely be interested! Nice! I don't have time to build one myself, but it looks very nice! You might already have a preference, but I found that polypropylene caps worked the best on my DownLow filter which is almost identical minus the buffering scheme. May be of some use to you. I'd love to hear it with those JFET buffers! I just used op amps on mine. It sounds good, but whenever I hear JFET buffered filters, they've got a bit more life and growl to them it seems. I put the big footprints there to accommodate the familiar polystyrene caps, but they should accommodate the polypropylene ones too.... I'll have to see if I have any and try it out, thanks for the tip! The biggest thing IMO is with opamps it seems to lock up easily with high resonance or high input level. (same thing). JFET buffers just kinda saturate, naturally compress and keep it from cutting out, or at least I think that's what is happening. Nice on the footprints. That's what I did as well. For the resonance, I used a back to back zener diode method that Dr. SnE showed me a while back. That keeps it limited nicely, but it's definitely tame. (which is nice sometimes, or for use for sine oscillation, but I like some of the sounds I've heard from things like Roland filters, the Serge '73 filter, etc. that use JFETs. I've never tried to build one like that myself. Ooh, yes, I would be all over that. Actually, I think I might be interested in one. I really need to build up a new synth to play with, and this, a pair of the LW FM Ogres, and maybe a few of my own items, I think would do the trick nicely. I'd be interested in building one of these. Panels and PCB are in and look good. Spacing of the mounting holes is ever so slightly off ... few mils.... so this first batch I'll be slotting the holes a bit. Screw head should cover it easily. Will be testing and finalizing BOM/values this week then a few sets can go out to people who are interested if all is well. PLEASE PM ME if you would like a set. if you've already expressed interest above will get preference but beyond that it will be first-come-first-served. This batch I have only 3 sets extra, they will be 25$USD for 1 aluminium panel and 1 PCB + shipping at cost. I think it came out lookin grand! The extras from this first run are all spoken for. Will be updating the thread once things are finalized and we are ready for a second run! Brief run through of the outputs with no effects. There are clicks and pops.... that's me swapping outputs. There are some tweaks to be made to get levels a bit closer, and one major oopsy requiring surgery on the current PCB set (damn you flipped OPamp symbols, you get me every time). Easily sorted for the next round. CV input jack adds to knob position. 0-5v range. VCA is fully open at 5V. There is some CV bleedthrough, not the best thing to use for AM abuse but lends a bit of warmth and is serviceable. 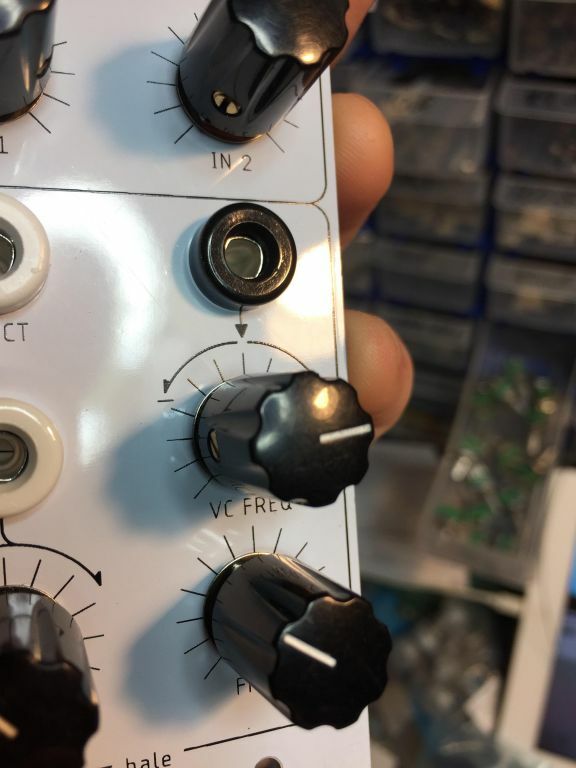 VCA is inverting and flips the 4pole output.... can be useful for feedback, or combining with the other outputs for some different responses.... mostly just a bonus feature. 5v input results in approximately +/-5v sine wave. It will resonate way down into the subsonic range.... slowest I saw was 4-5 seconds. Mix knobs will take the level just slightly past unity. The rest is I think self-explanatory. I will post a BOM when I'm settled on it after playing with it for a bit more. here is some build information for the first set of PCBs. I'll also be emailing this to the people who grabbed the first run. This will be updated for the next set which will have some minor changes. I'll start a proper build thread when those are ready. You may also want to use an audio taper pot for the Q control or tack a 20k resistor between the center pin and ground on a linear one for a better feel.